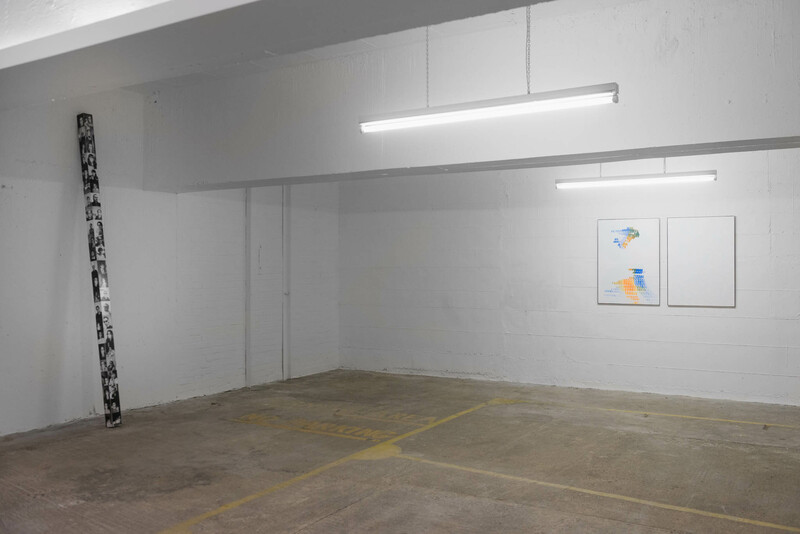 Dennis Loesch, installation at PM/AM Gallery, photo Erik Saeter Joergensen. Despite the variety of media and means available for artists to make their mark upon the world, or add another object to it, painting will not go away. In recent weeks, for the London-centric art viewer-visitor, ‘must see’ lists would surely have included the extremely painterly and mightily abstract, John Hoyland: Power Stations Paintings 1964-1982 (Newport Street Gallery) and the supreme and breathtaking Frank Auerbach (Tate Britain) exhibitions; and of course Frieze and Frieze Masters in Regent’s Park. Just before the recent spate of shows, the Sonia Delaunay and Agnes Martin exhibits at Tate Modern, in contrasting ways, would have revived (if needed) a battery re-charging of the potentials, and achievements, of abstract painting. With such major events filling the diary of necessary distractions (especially from the daily routines of studio practice, if you are an artist) smaller shows, or venues less well known, can be overlooked. So, at the start of four days of consecutive gallery visiting, culminating at Frieze Masters, I headed for the mid-show breakfast event of Merge Visible: New Digital Paintings by Dennis Loesch at the PM/AM gallery, a newly renovated space located on the Old Marylebone Road, where the artist would be present. 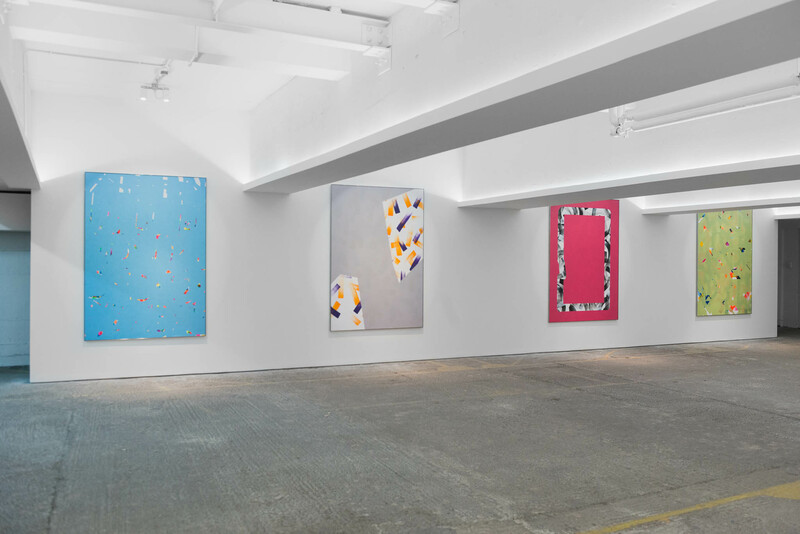 This venture, to introduce mostly German based artists to the UK, has been set up by Patrick Barstow (London) and Lee Colwill (Berlin), handily coinciding with many critics and collectors being in town for the Frieze events. 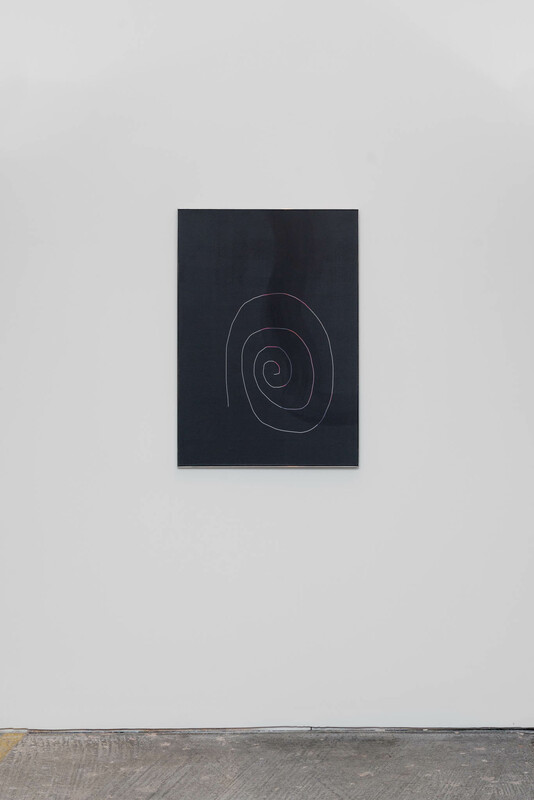 Berlin-based artist Dennis Loesch, who was trained in Interdisciplinary Fine Arts at the Städelschule in Frankfurt has not exhibited in the UK before and from the press release for Merge Visible we learn that Loesch’s imagery from this, and previous projects (not restricted to painting), present an engagement with “display management” and that he has a “fascination with the digital”. We also read that this recent work “Reveals a new discourse for the artist that investigates the interplay, temporal connections and history between digital imagery and classical painting technique”. It’s worth saying that I was drawn to visit this show, via receiving the press release and seeing his work on-line (how else? ), because the apparently abstract imagery is derived, to some significant degree, from digital sources: but I could not really connect with the work from digital reproductions and felt that I really did need to see the originals – a decision most useful as the paintings are made to be experienced ‘in the flesh’ and not in a purely digital environment as some ‘Post-Internet Art’ might be. In fact, I wonder if this work teasingly almost becomes a form of post-Internet art? Critic, Brian Droitcour’s definition as “art being made in the context of digital technology” (see ‘The Perils of Post-Internet Art’ in Art in America) would appear to consent to this. But Loesch’s approach, to producing paintings in this instance, might be more accurately defined as Conceptual and/or Post-Painterly. If there is an element of teasing (my interpretation), I mean it in an ironical sense of requiring the work to be experienced as materially painting (by various means), and as continuing the long tradition of painting as we understand it, but in relation to the non-material, digital environment. This personal interest was also abetted after seeing the small but suitably differentiated survey display, ‘Painting After Technology’, at Tate Modern where I was especially fascinated by Wade Guyton, Sigmar Polke and Christopher Wool’s imagery and means of production. It could be that overt contemporaneity is essential for some painters in the sense that the new technologies in image manufacture, appearance and dissemination (Walter Benjamin’s, The Work of Art in the Age of Mechanical Reproduction, is of course a key text) are programmatically allowed to impact on their practice – though I would argue that Auerbach’s daily record of his interaction with painting his portraits and urban street views are as contemporaneous, and empirical, as you can get. In Merge Visible (note: Merging Visible is a Photoshop term for an action to fuse together, as one layer, a number of visible, overlaid images which makes them inseparable) the digital sources, or references, are not so obvious – a conscious ploy I assume – as not even pixilation was mimicked that one might see in, say, Dan Hays’ ‘Colorado Series’ (where the pixilated rendering in oil paint is crucial of course). Loesch’s paintings are exquisitely made, with brush marks applied with precision, and ink-jet layers are added to each composition in a variety of configurations and colour schemes, part-covering the various ‘brush marked’ surfaces. For the digital printing to be applied perfectly the surfaces are carefully prepared and this attention to immaculate production is carried through to the final gallery display in smart, well engineered, aluminium frames. All, this might suggest, is mere surface – and digital depth is shallow, despite an approximation with traditional painting. My deeper reaction to the show, one that prompted questions that should be heeded but do not necessarily provide clear-cut answers; or reactions that are not definitively for or against, set me on a train of thought that I suspect will sustain me for some time yet. Synthetic, processed images (I’m trying to avoid the gendered term ‘man-made’) intervene and negotiate with the perception, representation and meaning of the physical and emotional world around us but, in this burgeoning era of digital technologies, many of us will quite possibly spend more time looking at and negotiating with a digital screen than in looking at original paintings, prints or photographs (that is, physical images, for even mass-consumption type pictures such as newspaper or magazine photographs are now virtual, or digital, too). One could expect therefore, for digital technologies to affect and influence contemporary painting in execution, form and content – for better or worse. The referencing of abstraction is interesting here, as mark making and individual characteristics of gesture are questioned (post-De Kooning, I presume); and, secondly, a Post-Modernistic trait to revive, or appropriate, is referenced as a testimony to painters who have been superseded by the Minimalist/Pop generations (I speculate, again). In briefly discussing ‘Untitled (DIN)’, 2015 Loesch referenced what he termed the duktus that was so crucial an element in the realization of the work. The duktus, or touch, is a characteristic style, script or brush mark that traditionally might reveal the author of a work. 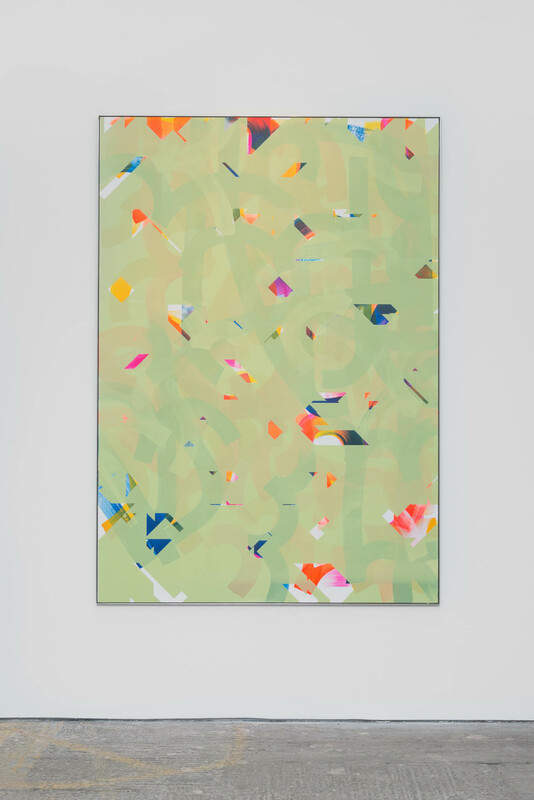 Loesch employs a highly skilled assistant from his team to produce these literally backgrounded, non-figurative flourishes of loose pattern-like configurations, presenting flatly brushed, linear meanderings of colour. But rather than having a particularly expressive, individual characteristic, the hand painted simulacrums of abstract-like application possess a flat, undemonstrative, digital ‘touch’ that, paradoxically, might be anonymous, even when executed by brush and hand in the long-established ‘haptic’ sense. 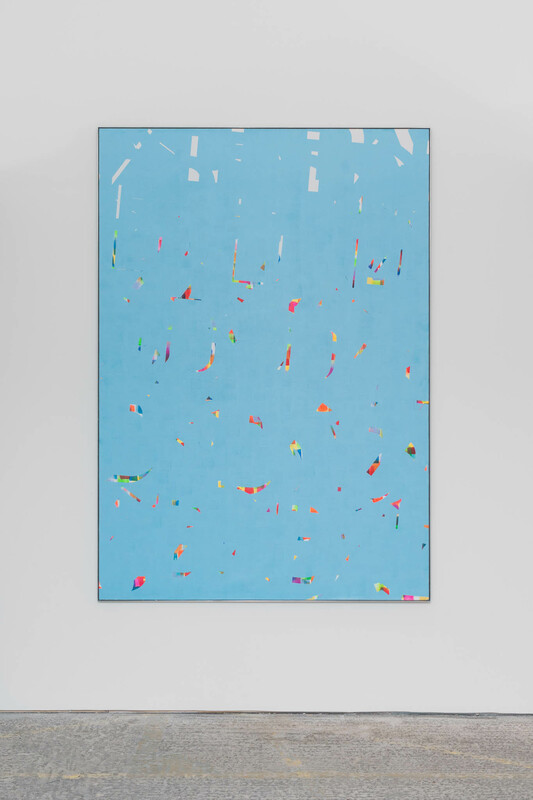 In ‘Untitled (DIN)’, ‘Lime Window’ (2015), and other works by Loesch, the hand painted brush marks are subsequently located behind the various UV-inkjet printed, meandering weaves or geometric shapes of light blue, lime green or other colours, and modified by these virtual brush or stencil-like shapes that have been rendered with a mouse or pen on a drawing tablet in Photoshop (or some similar program). These painted areas are typically part obscured by the printed digital interventions applied on top (the literal foreground) that act as portals and semi-translucent or solid shrouds. Despite the implications of the apparent digital-disconnect from the physicality of conventional painting tools, an actual, but somewhat removed, digital rendering tool, which never comes into contact with the actual canvas surface, has been legitimately employed. Thereafter, colour shapes are applied ‘by proxy’ by a digital printing machine having been created, earlier, by the intervention of the mouse mat or tablet. The so-called virtual/digital becomes real, materially – challenging definitions of authenticity and, paradoxically, creating the hyperreal. Dennis Loesch, “Clouds Over Liverpool”, photo Erik Saeter Joergensen. 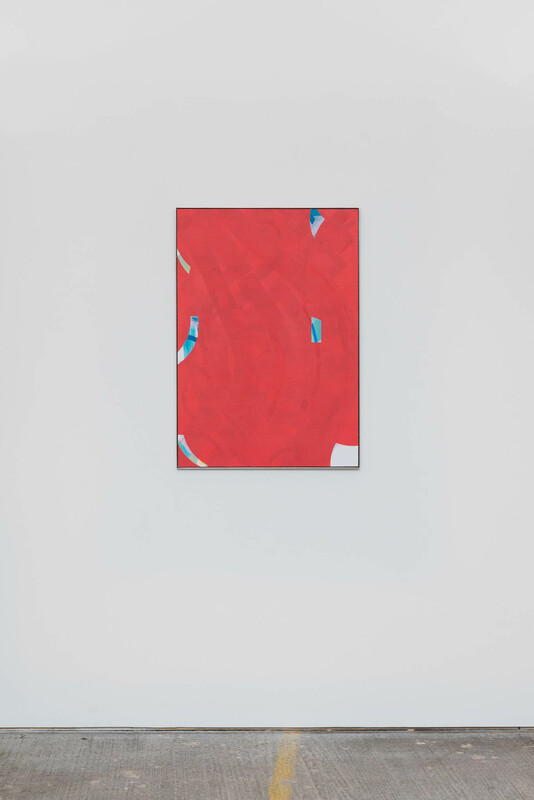 Certainly, in the main series of works that dominated the display at PM/AM, one sees a kind of sampling of the gestural and abstract, creating pleasantly colourful, abstract-pop-paintings that are rendered as almost flat, referencing a reproduction aesthetic. The flat print of the ubiquitous imagery (say) of advertising, or the glassy smooth-screen digital interface, might suggest that a kind of degenerated image is the result, usurping and transforming the proto-image (the painting) to a state of bland nothingness or ‘mere’ digital decoration or re-framing. I wonder, too, if Loesch’s activity as a ‘painter’ approaches a situationist posture – critiquing traditions of easel painting and being fetishistic in sexing up, with seductive technique, the non-living, objectness of a painting? Or, is this post-painterly, cool? It’s almost (I’m not sure) emotionless – but I am affected by the visual frisson. Are these pseudo-paintings (made by a real-life artist, albeit with his technically expert assistants)? Are the works quotations of a sort – planned, rendered and delivered in a post-Rauschenbergian, anti-expressionist, neo-Pop-ness? Also, do I detect a certain wry humour? How have my various reactions been stage-managed? Are the painted marks truly, but tritely, meaningless? 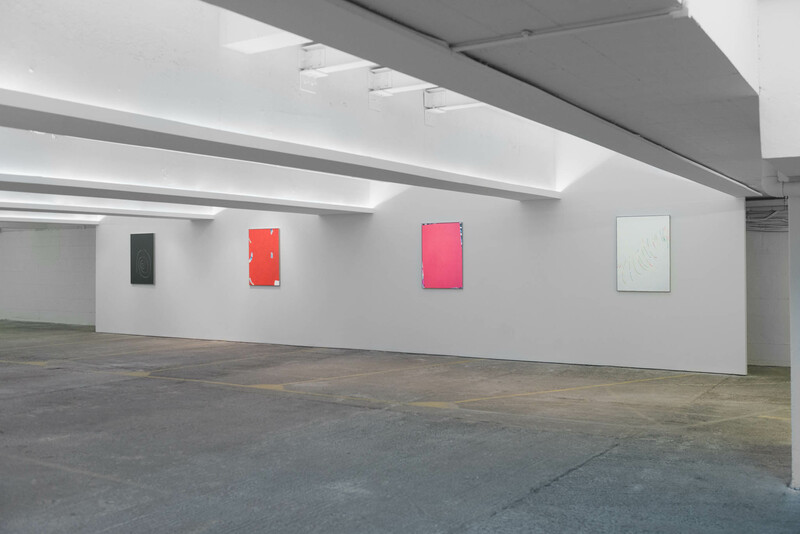 However, there is a neat tastefulness about these paintings, which might signal a philosophical meditation on the relationship between analogue and digital. Digitally low-res information results in a degradation or subversion of the image (digital image files are not physical, concrete things like analogue negatives and prints) and the new arena for images seems a less secure environment (especially when your hard drive crashes and you have no back up); but the colourful digital screens and wavy cancellations are, superficially at least, more than satisfactory at that “first view” – perhaps because the eye can be mislead by initial appearances. 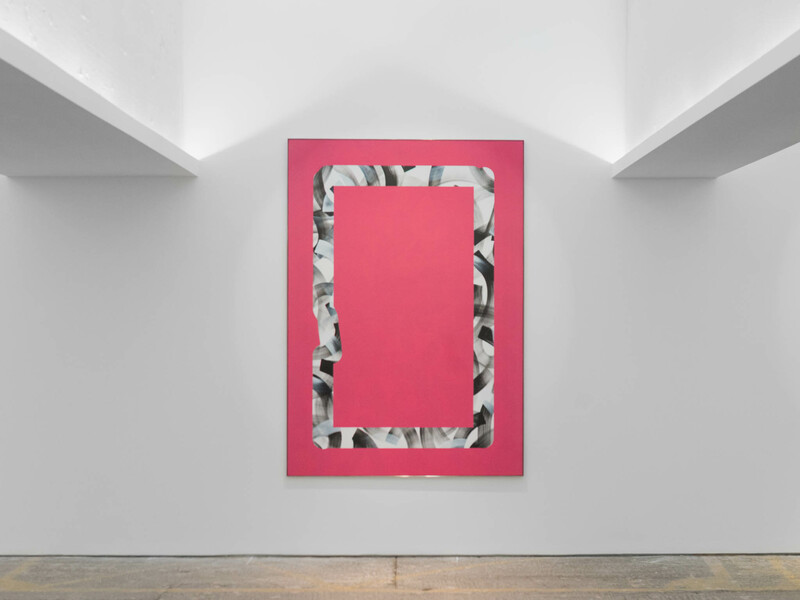 Therefore, does Loesch’s juxtaposing of combined painted and printed surfaces question the nature of the engagement with paint to produce a dystopian vision for painting, where the digital introduces a veil of superficiality, despite the production of a beautifully crafted, lush, surface? Actually, nothing is really hidden as the final, merged, ‘image’ presents a self-reflective dichotomy in the real presentation of images of nothing. Or, conversely, is there a positive revivalism, for abstract painting at play here? The works have a sophisticated and engaging visual impact that I find hard to dismiss. They look good on the wall. So, is the truth somewhere in between – in a state of limbo? Perhaps these sort of unanswered questions are what Loesch wanted his work to generate? In some circumstances, questions avoid answers – especially where the work might actually be provisional (to coin a phrase). Some of my comments and reactions so far may have become overstated and I could be walking a tightrope above a chasm of ‘artspeak’ indulgence, but a selected example from Loesch’s Merge Visible series would certainly fit well with the premises of the ‘Painting After Technology’ exhibition at Tate Britain, and a larger survey in the future surely would have to include something from Loesch’s studio. These words might be applied to many examples of, so-called, post-Internet art, although Loesch reacts to Minimalism’s desire to be rid of pictorial and traditional content by doing little more than morphologically referencing mark making (kind of), framing, and organized illusionism through pictorial or planar space. There is also a mechanical, perfunctory edge to the work, which perhaps questions authenticity in the age of digital media, where appropriation is endemic and the simulacrum is mistaken for the real. As with many examples of abstract painting, rightly or wrongly, non-figurative manifestations will beg the question: What are we looking for/at/into – and why do we need to? I think Loesch’s work does this; and we may find many answers. Certainly, the traditional is now challenged by the digital revolution that will shape the future of painting: and Loesch (and many others) are responding enthusiastically. By way of contrast, you might be interested in this. I call this pseudo painting rather than digital painting. Thank you, Sandra. This example of ‘New Media Art’ appears to demonstrate the absurdity of the digital referencing a painting/pictorial idiom. My use of the term ‘pseudo’ was probably mistaken or not qualified enough. I guess that so-called digital artists, as we see in your example on saatchiart dot com, who ‘aspire to the condition of painting’ (my apologies to Walter Pater) will fail miserably. I’m not so sure it’s about ‘aspiring to the condition of painting’, after all the images are totally flat, but about exploring the pictorial aspect of image-making further and the medium divorced of its material condition. Well, there is always a medium (to be pedantic). Perhaps ‘digital’, like early photography, is bound to reference painting initially. Well painting has been the stalwart of picture-making for millennia, principally as a medium to describe, now we’ve got entangled in ‘the medium is the message’, but in the end, it’s all imagery, whatever it is. Isn’t the true digital medium in fact code though? Since the demise of the clunky early processors a recognisable Digital aesthetic – the pixellated block – has disappeared, instead we now have an almost pure carrier for information, seamlessly integral to the hardware. Far from some ‘paradigm shift’ digital hasn’t really altered artists strategies much; what is ‘radical’ about collage, layering, blur or re-touching, even Loesch’s rectangles? Eisenstein’s montage? Musique concrete? Not exactly perspective or cubism, obsolete computers under the stair attest to the hype. Painting as illustration for theories which don’t test well in the messy world, like economics without debt. We still have to input the world into the digital and output back into the world, it’s lasting effect one of speed, availability of global communication and mountains of consumer waste more than anything. Re: Sandra’s comment above (“it’s all imagery”) – There is a sense of any artwork (2D/3D) having an ‘image’, whatever the medium, as the observer/viewer has a mental image in one’s consciousness. However, as a painter who uses oil and acrylic paints, I feel strongly that traditional media (especially oils) have a quality that the visualisation of digital code (whether it is printed, projected or glowing from a screen) cannot have. I find Loesch’s (and others – including Mary Ramsden’s) work of interest as the digital is assimilated into their ideas and painterly outcomes. That’s not seeing how far painting can be pushed, that’s the conceit of an non-visionary person, it’s not about the visual. With reference to the quality of oil paint, if you’ve got £40,000 you can get a perfect digitally produced reproduction, you wouldn’t know the difference and now with 3D printing, soon you’ll be able to 3D print an Auerbach. Personally I think the true digital extension of painting will be augmented reality, where the computer will finish off the work of art i.e. you do the chaos and the computer will overprint the underlying order. Still bound up with printing though, but I agree to a degree Sandra, it will become more interesting. We have printable coloured mass already and textural reproductions – Thomas Kinkade! However, these prints are after the embodied act of the artist and merely processed evidence. Improved hardware, tools, not digital as a ‘medium’ – useful, interesting and different thats all. Digital in itself is closer to text. A way of recording instructions. The code = the score? Present in the 3d world for years, I’ve certainly pissed enough money away on it, however it necessitates ‘design’ rather than being in the moment, physically engaged with stuff. For example; Z-Brush clay modelling outputting to a 3d printer, that really is infuriating and a pointless detour away from the immediacy of a piece of clay in my hand! Or scanning my ‘intuitive’ sketch to email Cad info etc.. just a different fax machine. I’ll take the ‘readiness to hand’ for the time being. I’ve posted a link (https://www.youtube.com/watch?v=RWkc993vRU8), to illustrate code v. end product, this video externalizes it, to an extent. I haven’t tried z-brush, I’m a technophobe, but in Photoshop there’s the liquify tool which smears and moves a bit like painting and now one can do touch-screen stuff, it does extend visuality because it can create otherwise doubtful imagery in an image-creation field. Yeah, it’s a nicely built machine, but just a luddite mp3 player in the end, not an instrument, you can’t have a real dialogue in space and time with either it or your fellow musicians. No matter how hard I tried I found DJ ‘culture’ vapid and boring, I’d rather be in the band, lost in the moment. Why have a player piano when you could learn to play a piano? As for digital painting scumble, still just vanilla, I want to put my finger in the cake mix and lick it! Why do these artists like Loesch still keep playing the Benjamin groove anyway? Is it just an easy way of getting your MFA essay done? Rodchenko and Moholy both mapped & phoned it in, dealt with it and kept painting anyway. Just like the urinal was reactive, look how little effect it had on subsequent sculpture, artists got the joke and carried on (Marcel included), it only ever pressed the bourgeois consumers anxiety button. If you want to understand a hammer pick up the hammer and hammer some nails, anything else is fluff for ‘academic’ bystanders. The thing to say about these paintings is that they are in no way new or good. but I think they had a more interesting layered, cut ‘n’ paste strategy. Trying to be open-minded here and put my prejudices for painting aside. In Maya Benari’s ‘rothkode’ we see the application of a medium (digital) to generate/form a visual outcome. The content superficially references Rothko’s paintings with, I guess, interests in interior design (judging from Benari’s professional interests). Of course, Rothko’s paintings are generated in a fine art (painting) context with a highly personal and philosophical/aesthetic/spiritual(?) framework. There’s no comparison really. as with much ‘discourse’ around the digital it’s the hyperbole that provokes, having been suckered into the ‘digital revolution’ starry eyed years ago when Macs were beige it’s now somewhat clearer. I fail to see any ground shaking difference in methodology between Hoch or Beardon cutting and collaging with a knife and collaging in Photoshop, or the meticulous hand rendered fantasies of Archigram versus Perry Kulper. Hence Fonseca’s ‘old school’ layering/revealing. The ‘Rothkode’ images are perhaps a bit of a red herring, they reminded me instantly of a dire documentary some years back where the OCD 6H pencil copy of a B&W photo were hawked about the art world – i.e. we admire the skill. It ended up in front of a non-plussed Hockney: “always about the bloody photograph” – I admire the skilful programming of the seamless gradients likewise. The link was sent to me by a programmer friend, I am more interested in his and his colleagues ability to read and visualise the code itself before it renders out a familiar image and if that is where the ‘medium’ if it is to be distinct resides? So there is a ‘piece’ of a sculpture, but is it? Personally it has little of the quality of sculpture that keeps me making the things. Things being apposite, the rest of the file contains all the information to make that object, but is it sculpture? No. I had several attempts at ‘making’ in the virtual 3d environment and realising by not building, using render, animation and printing out the .dxf text file. All in the end profoundly unsatisfying. Too much design. After twenty odd years the digital brings to the 3D party little more than a plasma cutter or fax machine did, a quicker way of cutting out parts or posting drawings. We end up as with so many conversations, back to the primacy of the human acting in the ‘real’ world, transforming brute stuff into meaningful things. By real world I mean neither ‘virtual’ or nor ‘brain in vat’ sense. Far from being undermined or brought into question etc… wrestling with the brute stuff wins out every time. Perhaps painters who do seem to struggle more with image, illusion or subject-object just have a different reaction to the digital?